Las zanjadoras Caterpillar para minicargadores Cat han sido diseñadas para excavar zanjas estrechas y rectas en el terreno para introducir conductos para cables eléctricos, telefónicos y de televisión, o tuberías de agua o gas. Las zanjadoras son ideales para trabajos residenciales, comerciales, agrícolas, de construcción de edificios, cuidado de jardines y mantenimiento de campos de golf. The direct drive T9 utilizes standard flow auxiliary hydraulics. The direct drive T15 utilizes high flow auxiliary hydraulics. Cat Trenchers provide the right balance of chain speed and torque for maximum productivity in a broad range of soil types. Trenchers are designed to operate with the loader traveling in reverse with the boom angled down between 45 and 65 degrees from the horizontal position for maximum performance in general trenching applications. Direct drive system features a variable speed, bidirectional, gerotor style motor that delivers optimal chain speed, chain pull and torque for maximum trenching performance. Hard-faced, medium carbon alloy steel cupped teeth are standard for long life in many soil conditions. 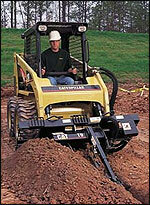 Teeth at every other station provide optimum trenching performance in most soil types. Optional rock teeth are available for aggressive trenching. A formed skid shoe acts as a pivot point and maintains proper spoil auger orientation. Three convenient, heavy-duty, deep skid-resistant steps (one located at the right rear and two on the top of the main structure) optimize operator entry and exit from the machine. Caterpillar XT and medium pressure hose, couplings and O-ring face seals provide superior leak free performance and reliability. All exposed hoses are wrapped with nylon woven Cordura sleeving for added operator protection.